Turning Technologies UK Ltd (TTUK) was established in 2004 and is the sole UK distributor for Nakamura-Tome high precision turning centres. 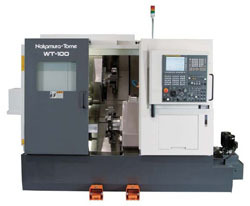 TTUK is dedicated solely to the sale and support of Nakamura-Tome multi-axis, multi-turret, fixed head turning centres. These hand-built machines have developed an enviable reputation around the world for delivering quality, accuracy and reliability, and are supported by TTUK's team of technical staff who all have been factory trained in Japan. All of TTUK's machines are capable of producing complex components in a single operation and follow the company's philosophy of one-hit machining, which aims to cut lead times, WIP and cycle times while increasing component accuracy. This has lead to the machines being used in a wide range of high-technology applications such as medical, aerospace and defence equipment, and within its biggest market sector of sub-contract turned parts manufacturers. TTUK is able to provide its customers with a complete turnkey engineering solution. Its team of applications engineers have extensive experience in designing efficient and streamlined manufacturing systems, ensuring that customer's investment payback period is reduced as much as possible. Its service, spare parts and administration teams provide round the clock support to ensure that disruption to production is kept to a minimum.